The past two weeks have been pretty quiet for our intrepid spacecraft. For the most part, she has slept, unpowered, while launch vehicle and ground system preparations have continued. 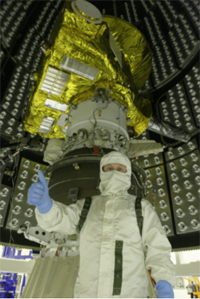 About the only real action came on Jan. 3, when the final flight parameter loads were installed in the twind computers New Horizons carries within her hull. The next two weeks will be more exciting. Our launch date remains on course for Jan. 17. That's just over a week from now. And whether we fly that day, or the next, or the next - in fact, whenever we launch - the mighty Atlas V//STAR-48 propulsion stack will hurl New Horizons to a speed greater than any spacecraft has ever reached when leaving Earth. Indeed, New Horizons will be traveling so fast after launch that she will cross the orbit of the Moon just 9 hours after crossing over the Atlantic beaches in Florida. That roughly 1/3-day trip makes Apollo's 3-day lunar trek's seem almost quaint. One thing I have never seen described is our planned suite of early activities on New Horizons. Simply put, we will spend the first month "out of the box" checking out spacecraft subsystems and flight software, fine tuning the flight trajectory to Jupiter, and preparing for the instrument commissioning activities that begin about five weeks after liftoff. Principal Investigator Alan Stern with the New Horizons spacecraft and its third-stage motor in the launch fairing. Throughout this entire period, New Horizons will be tracked 24x7 by NASA's Deep Space Network (DSN) of antenna stations. Mission controllers will be "at the spacecraft's side" every moment during these crucial early days. Everyone on the project is looking forward to New Horizons being under way, a free bird, at home in zero-gravity and the clear, clean vacuum of space where she was meant to thrive - hurtling outbound to a date with the ninth planet about nine years hence. Stay tuned for more updates on this page as launch approaches and we get under way with the flight mission.